Since the launch of the Intel Coffee Lake range of processors we’ve been limited to just a single, high-end Z370 motherboard chipset. That’s set to change soon as the more price-conscious H370, B360, and H310 motherboards have started appearing in the wild. Until they do launch check out our pick of the best Intel gaming motherboards. 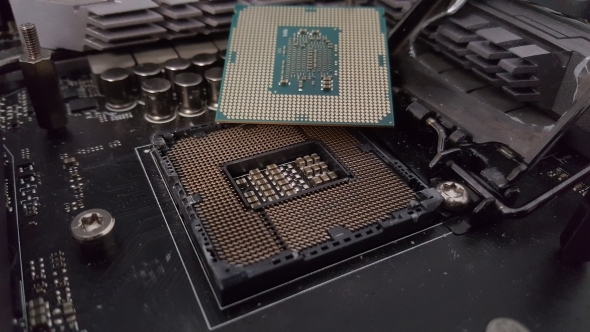 The motherboard manufacturers have been very good at creating Z370 motherboards at a wide range of price points, but you would still end up paying for features that you wouldn’t really need if you were to buy, probably our favourite Coffee Lake chip, the Core i5 8400. It’s a strange situation that we haven’t seen before with any other Intel CPU launch. Previous generations have gone live with a full range of both chips and motherboard chipsets, but Coffee Lake only launched with a handful of chips – in some retail channels quite literally – and a solitary chipset. Thankfully the mainstream chipsets are close to launch as they’ve started appearing in online databases, such as SiSoft’s ever-reliable Sandra, on a Vietnamese retailer’s site, and on a Thai distributor’s site. The AnphatandSynnex sites lists a broad range of different boards from different manufacturers across the H370, B360, and H310 spectrum. Aside from the names, however, there are few real details about all the different motherboards, with only a couple giving away more information than just their names. So there’s no reliable way to know for sure how many x16 PCIe slots you’ll be getting on each or which chipsets are likely to be capable of supporting overclocking. There are a mixture of ATX and micro-ATX designs on offer, so it looks like there is going to be a serious second wave for Coffee Lake coming soon. Accompanying the chipset launch will be new processors too. We’ve spoken in the past about the listing of new Coffee Lake CPUs, but the new Core i3 and Core i5 chips have also just started appearing on retail sites. Like the motherboard pages, the processor store listings are pretty light on details, but thanks to earlier leaks and listings we can start to put together what’s probably a pretty reliable picture of the next slew of Coffee Lake processors. Intel were always going to have to do something Lake-y in the middle of this year. With the red team releasing their own refreshed AMD Ryzen 2 processor range in April, Intel have got to build on the somewhat limited success they had with their initially rather meagre Coffee Lake lineup. Who knows, we might even see some evidence of the purported Z390 motherboard coming soon – it might even get itself a Core i9 processor to go with it. An octa-core Coffee Lake anyone?